This SDK supports Unity versions no older than 5.4.0. iOS minimum version support is 8.0 and Android minimum version support is API level 11. Please download our latest SDK. Download the SDK, and import the TapdaqUnity.unitypackage into your project. 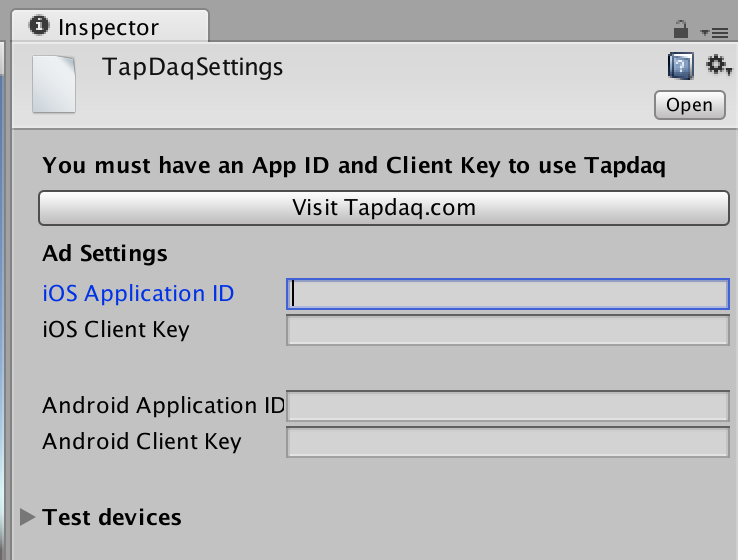 To do this, select Assets > Import Package > Custom Package..
To add in your iOS and Android App ID and Client Key, simply go to Window > Tapdaq > Edit Settings. A panel will appear in your editor prompting you to enter your Tapdaq App ID and Client Key (these can be found when logging in to the Tapdaq Dashboard under Settings > General). Note: If your app supports iOS and Android, you will need to create two separate apps on the Tapdaq dashboard. Create a script and add it to a GameObject in your scene. Consent can be updated mid session as well as at initialisation, it can be set and unset. Within each of your scenes, your script must override a MonoBehaviour method OnApplicationPause to report lifecycle events to Android ad network adapters. To display an advert, please click on one of the following guides. You can test that each ad network has been integrated correctly by visiting the Debugging page. Please add the following entries in Target -> Info -> Custom iOS Target Properties. These steps are required when submitting your app to the App Store. NSCalendarsUsageDescription: Set the type to String and set the value to the following Some ad content may create a calendar event. NSPhotoLibraryUsageDescription: Set the type to String and set the value to the following Some ad content may require access to the photo library. NSCameraUsageDescription: Set the type to String and set the value to the following Some ad content may access camera to take picture. NSMotionUsageDescription: Set the type to String and set the value to the following Some ad content may require access to accelerometer for interactive ad experience. When building iOS projects to Unity, frameworks may not be imported correctly, after selecting "Switch Platform" to iOS, select the Unity Editor window to allow our script to run, then go back and Select Build.